“Jack Heslin tells the powerful true story of his first combat tour of duty in Vietnam. He brings that long-ago war to life as he recounts his baptism under fire and his subsequent mastery of the flying skills and tactics so essential to his surviving some of the most intense combat of the war. 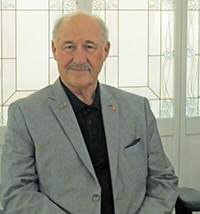 He gives extraordinary insights into battlefield leadership and unit dynamics.He tells what it was like being an Army helicopter pilot engaged in special, highly classified missions supporting secret commando operations behind enemy lines in Laos and Cambodia. Jack writes of hovering below treetops with bullets ripping into his aircraft; flying battle-damaged aircraft, shedding pieces of rotor blades in flight; and many other harrowing actions.A fascinating read.” —William Reeder Jr.Author of Through the Valley: My Captivity in Vietnam THUNDER: Stories From the First Tour is a riveting account from a combat helicopter pilot in the period of the most intense combat for American forces during the Vietnam War, including Tet of 1968. 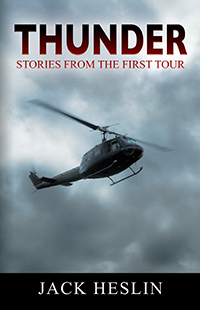 Climb into the front seat of a combat assault UH-1 helicopter with Jack, and experience the intense fear and exhilaration of flying through a hail of bullets to save dying men. The intensity of the action is matched only by the gravity of the situation at this crucial time in the war. Jack takes you from his arrival in-country with an assault helicopter company, where, on his first night in Vietnam, the only thing he had to defend himself with was a single, silver .38-caliber bullet. The journey from “peter pilot” to being “Blue One” as a Platoon Commander and, finally, as an assault helicopter company operations officer in the Highlands of Vietnam will keep you on the edge of your seat as Jack flies into one terrifying situation after another. Feel the sense of power thundering through the skies of Vietnam, where you know any moment could be your last. Read about the top secret SOG missions into Laos and Cambodia where small Special Forces teams battle against huge odds along the Ho Chi Minh Trail. You are there when Jack is shot down in Laos on the Ho Chi Minh Trail and fights his way to the rescue helicopter. Visit a leprosarium with Jack as he listens to small children sing Christmas carols and then travel in a jeep through the night under the protection of a Catholic nun. Experience a Montagnard ceremony with Jack and elite Special Forces soldiers where rice wine is liberally served and brass bracelets are presented by the village chief. This non-fiction book is the real deal. It is all real; it all happened, and Jack lived through it to return home to his wife and family.